Whether you’re motivated by a workplace initiative, a personal goal or the opportunity to teach your children lifelong positive habits, now is a great time to become more environmentally friendly. Earth Day is April 22, but there’s still plenty of time to develop eco-friendly habits before the big day arrives. Here are three ways your family can create positive environmental change starting today. Research shows that less than 2 percent of waste in the United States is recycled, yet almost half of all trash can be recycled. School lunches are one source of waste that most families don’t consider. These are packed each morning and tossed away each afternoon once lunchtime is finished. To increase awareness of recycling options during lunch, Entenmann’s Little Bites Snacks has partnered with the recycling and upcycling experts at TerraCycle for the “Turn Trash to Cash” program, giving students the chance to recycle their Little Bites snack pouches and earn money for their school. TerraCycle can recycle the pouches to create products like tote bags, pencil cases and even picnic benches. You can learn more about the campaign by visiting TerraCycle on Facebook. Water is one of the most important resources people have, yet every year billions of gallons are needlessly wasted. You can conserve water in your home by teaching your children to take shorter showers or baths, turning off dripping faucets and avoiding letting the water run while they are brushing their teeth. You can also reduce water waste in your home by investing in water-saving appliances and by reducing or eliminating the practice of watering your lawn, relying on rain to do so instead. 1. Trees help clean the air. They improve the quality of the air you breathe by capturing dust and pollution particles that can affect your health. 2. Trees help fight climate change. As trees grow, they remove greenhouse gases like carbon dioxide from the air, store carbon, and release pure oxygen into the atmosphere. 3. Trees planted along waterways can help filter out chemicals that might otherwise wash to water sources. They also can create stable soil and help prevent soil erosion, flooding and even landslides. 4. 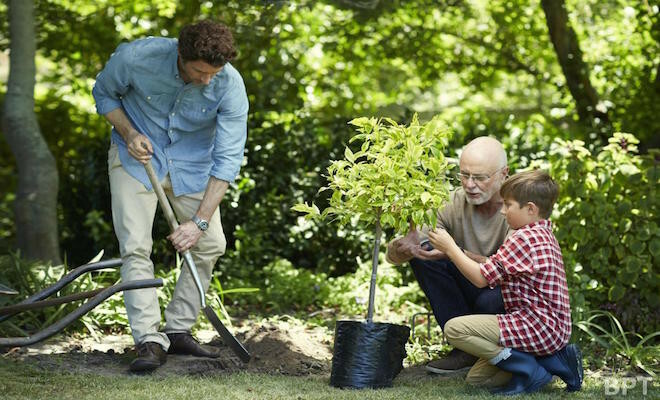 Trees properly planted around a home can help lower air conditioning and heating costs by up to 25 percent. This year Entenmann’s is partnering with the Arbor Day Foundation for the Little Bites’ Earth Day Sweepstakes. For every entry, fan or not, received through the Little Bites Facebook page, Entenmann’s will donate $1 to the Arbor Day Foundation to plant a tree – up to 25,000 trees in total. The sweepstakes starts March 1. You can learn more at the Little Bites Facebook page. Environmentally friendly habits are easy to pick up and they can be a great way to bond with your children on a shared project while developing lifelong habits. So don’t wait another minute! Start your family down the eco-friendly path today.